Well, hello there Tuesday and September! I’m already looking forward to the weekend because I just had one of those weekends where you need a weekend to recover from the weekend. I guess you can say I had too much fun! Although I don’t really want summer to end, and we all know Labor Day weekend is the unofficial end to summer, I’m still hoping summer weather sticks around for just a little bit longer. I’m trying to wear all of my Greece wardrobe for as long as possible too. 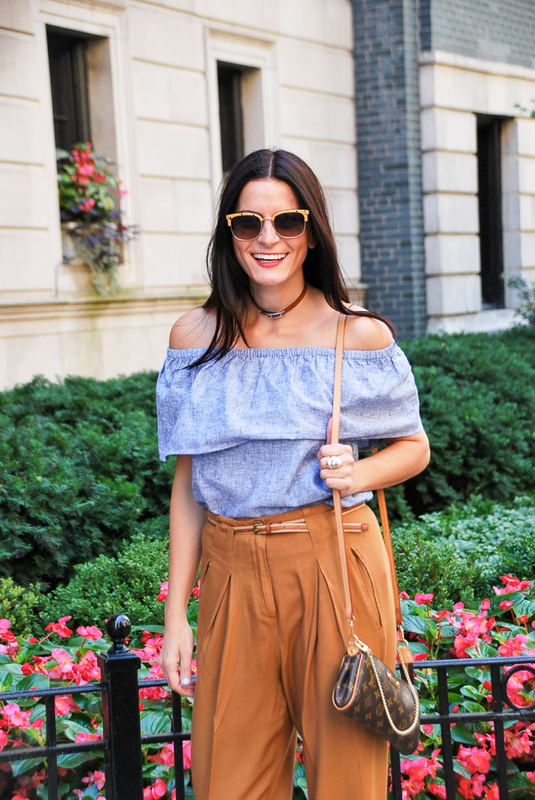 I actually just stumbled upon this outfit because originally I wanted to wear these mustard pants with another top because in my head it totally went together, but when I actually wore the top I had in mind with the mustard pants, something just didn’t click. Ever have those moments? Anyway, this linen chambray top worked much better for this look and I really like this color combination. I can totally play off this look for fall and switch up the shoes as well. Definitely still all about the versatility and longevity of my clothes!